By Scott Gilfoid: Martin Murray (36-4-1, 17 KOs) will be challenging WBC Silver middleweight champion Roberto Garcia (41-3, 24 KOs) on June 23 at the O2 Arena in London, England. Murray was supposed to have been challenging WBO middleweight champion Billy Joe Saunders on June 23, but he suffered a hamstring injury and pulled out of the fight. This was the second time that Saunders, 28, suffered an injury while training for the fight against the 35-year-old Murray. Murray will be fighting the 38-yesr-old Garcia on BT Sport and BoxNation. Murray is a former 4-time world title challenger. He’s interested in challenging for a fifth time against a world champion, but he’s going to need to keep winning and waiting for another opportunity to come along. Perhaps if Murray looks good in beating the Mexico born Garcia, he might get a shot soon. Murray is ranked #5 WBO and #7 IBF. Roberto Garcia is ranked #6 WBC. Murray is still upset at losing out on a title shot against Saunders after he pulled out of the fight last week because of an injury. Murray hadn’t done anything to deserve the fight against Saunders other than fail 4 times previously in challenging for world titles. It’s more likely that Murray was chosen because he’s not a threat and due to his name recognition from his past failed title shots. After Saunders was injured the first time in training camp, he said he wasn’t going to let Murray down by cancelling the fight. But this all changed after the second injury by Saunders, as he chose to walk away the second without rescheduling. Roberto Garcia, 38, has won his last 13 fights after losing to Antonio Margarito by a lopsided 10 round unanimous decision in May 2010. Since that fight, Garcia has beaten a whole host of obscure fighters, burning through 8 years of his career without being moved quickly by the sanctioning bodies. Had Garcia simply fought contenders in 2011 and 2012, he would have been ranked highly, but for some reason he and his management didn’t take that route. They chose weak path, going poor opposition and weren’t moved up in the rankings. Well, Roberto Garcia is NOT a champion. He’s a WBC Silver strap holder, which is completely different from being a champion. With that said, Murray can get pushed up high in the World Boxing Council’s top 15 ranking if he can add Garcia’s scalp to his collection. That’s a big if though, as Murray looked terrible in winning a highly controversial 12 round majority decision over journeyman Gabriel Rosado last April in Liverpool, England. I had Rosado winning 9 rounds to 3 over Murray. The fight was the worst scored bout I’d ever seen before. Murray looked like a shot fighter getting worked over by Rosado, and it was so sad that the judges were unable to score the fight correctly. beat WBC middleweight champion Gennady Golovkin. Murray was already knocked out by Golovkin by an 11th round knockout in February 2015. Golovkin took it easy on Murray for the first 10 rounds before opening up on him in the 11th round and scoring a stoppage. A lumped up Murray said after the fight that Golovkin doesn’t hit hard. It was kind of hard to take him seriously given how badly bruised his face was. Murray basically just ran and held for the first 10 rounds When Murray stopped running, Golovkin knocked him out in the 11th. 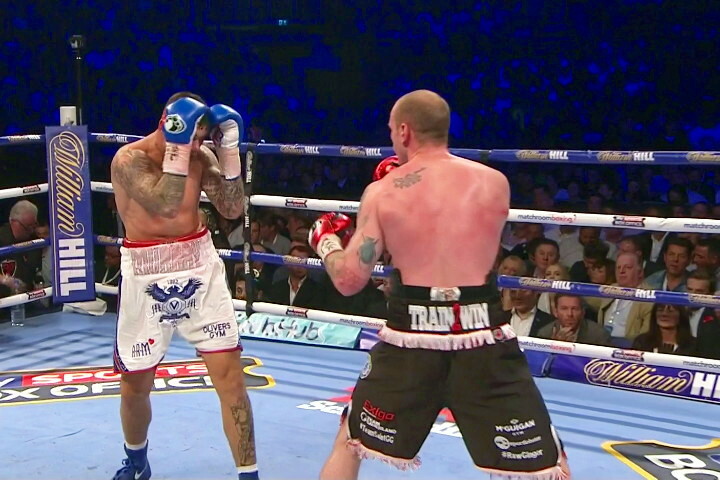 Since that fight, Murray was given a world title shot against former WBO super middleweight champion Arthur Abraham in November 2015, which he lost by a 12 round split decision. I don’t know if you can count on Murray beating a pressure fighter like Garcia, as he tends to clam up when he’s facing pressure fighters. Murray hides behind his clam-shell high guard when he faces fighters that take the fight to him, and he basically gives the fight away. If Murray clams up against Garcia, his only hope of winning the fight is if he gets judging like he did in his fight against Rosado. Murray clearly lost that fight, but the very questionable judging from the three judges assigned to the fight saved the day for him. Garcia should be thinking knockout all the way if he doesn’t want to end like Rosado and get robbed.